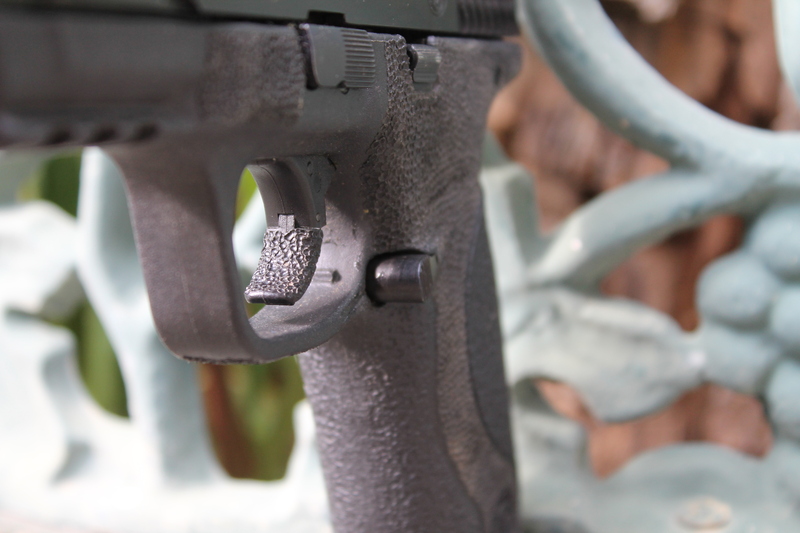 Sometimes, the reach to the mag release on ye olde M&P is complicated. Either it is too small, or too far away, or too slick, or too plastic. But LF Arms has the answer for what ails you in the form of their standard length and extended length replacement magazine releases. I found them both to be most excellent. The LF unit is a direct drop in replacement for the stock part. No cutting, filing, or lubing is necessary. 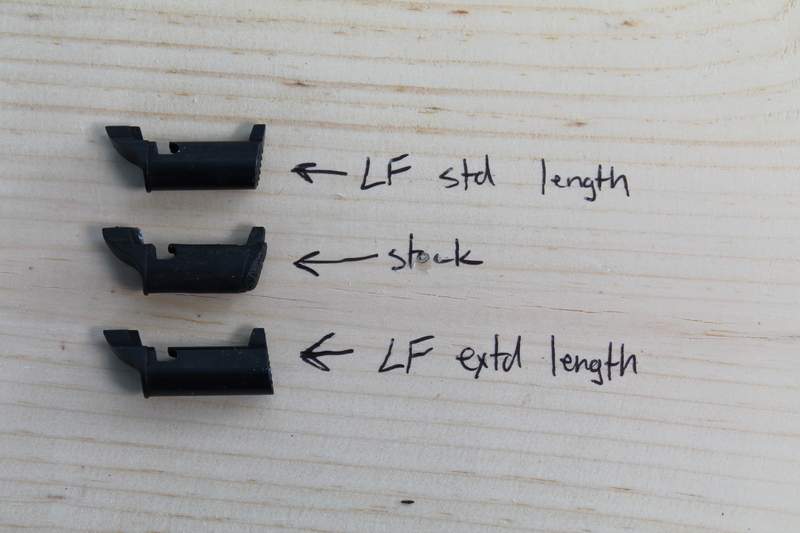 As you can see in the photo above, the standard length matches the stock plastic profile almost exactly, but features more aggressive patterning on the button. Replacement is a snap, and can be accomplished easily with the takedown tool in the grip. Both mag releases work very well in retaining the magazine, but also not getting in the way of business. Their all steel construction adds negligible weight, but inspires much confidence. With my tiny little hands, releasing the mag on any modern polymer handgun is an exercise in frustration. With the exception of the FNS 9, which allows me to push the magazine release in both directions, most guns have mag releases too far away for my hands. The FNS solves this by giving me the flexibility to use my trigger or middle finger to release the mag, which doesn’t compromise my grip. The M&P possesses no such flexibility, so you make do with what you have. In my case, the extended mag release from LF makes releasing the magazine a much easier affair. I still have to shift my grip ever so slightly, but not nearly as much as I do with the standard length button. Neither of the replacement releases from LF messed with the holsters I have for the M&P as all of the holsters I own don’t cover the mag release. If yours does, the standard profile will surely work, but the extended length might require some fitting of the holster. This is a true drop in replacement for the stock part and required no fitting of any kind. A solid piece of steel is much more confidence inspiring as is the aggressively textured surface of the button. I don’t think of a magazine release as being a “must have” for the M&P like a trigger replacement, but it certainly is nice, and for less than $30, you really can’t go wrong. Christmas is still a few months away, but this would make an excellent stocking stuffer for the M&P owner in your life. @Tyler: Regarding your small hands, you may wish to check out the Walther PPS and its mag release positioned in the bottom of the trigger well. I see you are a stickler for stippling! Amazing what some hand finishing can do to otherwise roughly machined parts. 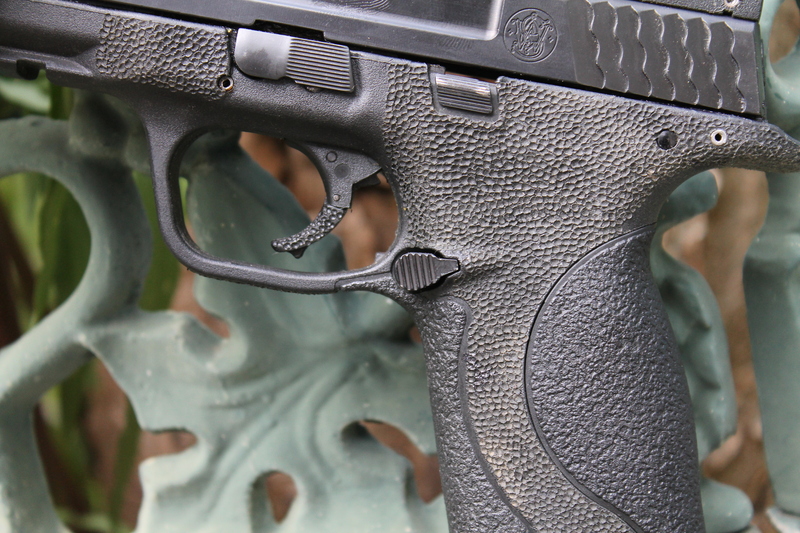 Polishing and stoning will enhance virtually ANY trigger, but especially striker fired handguns where you have various components sliding and dragging across each other. I’m not sure to what you are responding, but personally I don’t like the way the M&P triggers are hinged in the middle. It pinches my skin somewhat, which wouldn’t stop me from using one defensively, I’m not sure I’d want to put in tons of range time with one. I don’t even notice the hinged trigger when shooting the M&P9. I tried out an Apex sear, but the improved stock sear on the ones made post Shield are much better so I went back to stock. The reset is much more positive if you like that sort of thing. I’ve been using one of the extended ones from LF arms for a couple months in my Pro series competition gun. It fixes pretty much my only complaint with the pistol. The stock part is just not easy to actuate, nor is it positive, or smooth. I use my M&P PRO for both IDPA and USPSA in ESP and Limited division respectively and this part is legal in both by a wide margin. I would recommend it to anyone who has an M&P. Main thing I like is I don’t have to re-position my grip to get to the mag release. I can easily get to it from my normal firing grip. Also it is machined steel, of which they did a very job. It is a perfect fit and is very smooth. It takes all of the mushiness out of the release. The M&p mag release is very easy to change, maybe took a minute to do the swap. Break your hand to engage the mag release. It’s how every SOF force teaches it. You have plenty of time during a reload to reaquire your grip. I ended up switching my mag release over to the other side. I can push it using my middle finger and not have to change the orientation of the firearm and keep the barrel on target if i still have a round in the chamber. If i’ve run it dry i made a mistake. I like the lever on both sides of my wife’s PK380, I to use my middle finger on the other side and not my thumb. I do have M&P full and think swithing it over is not a bad idea, just haven’t got around to it. Meh. Now the tiny slide release, that is second after the trigger. New thread, but I know some are ademant about it being a slide lock not a slide release. What do you call it and use it? 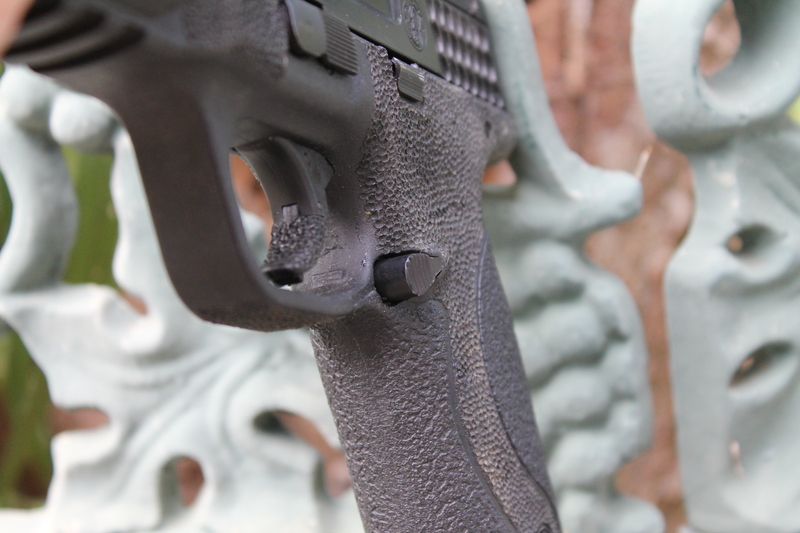 The XDm mag release is also ambidextrous. With my stubby thumbs, I value the ability to drop the mag using my middle finger. Gosh darn-it! The super-secret lefty’s trick is out! Why do you think most southpaws aren’t upset with the mag release on the left side? Rats! Now all the dextrous folks will want a sinister ambi-mag release installed! Ahhhh Crap! I totally forgot about my XD(m). Weird since its ever present.